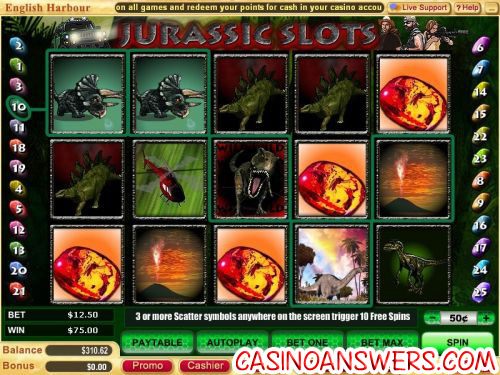 Jurassic Slots Guide & Review - Casino Answers! Jurassic Slots is a 5-reel, 25-line video slot developed by Vegas Technology. Features in Jurassic Slots include a bonus game, free spins, scatter wins and wild symbols. 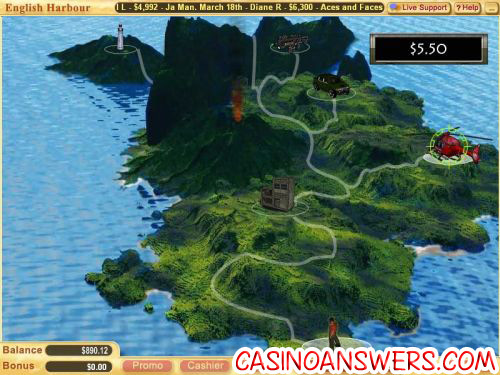 You can play Jurassic Slots at English Harbour Casino and Crazy Slots Casino. As should be obvious by its name, Jurassic Slots is based loosely on the blockbuster film Jurassic Park. One hint of this is the intro video, which shows a helicopter heading to an island and fading into the eye of the Tyrannosaurus Rex. The dinosaur theme of Jurassic Slots becomes more evident when you get to the actual slot machine itself. Besides the dinosaurs such as the triceratops, stegosaurus, velociraptor, brachiosaurus, pteradon and the T-Rex wild symbol, the other symbols consist of a volcano, mosquito, helicopter, jeep and a girl holding a rifle. There is also a scattered jungle symbol and egg bonus symbol. All of these symbols are animated and will play when they are included in a winning combination. Coin values on Jurassic Slots are $0.01, $0.05, $0.10, $0.25, $0.50, $1, $5 and $10. The minimum bet is $0.01 if you wish to play only one line and $0.25 if you wish to play all 25 lines. The maximum bet is $250 per spin. The top jackpot on Jurassic Slots is the brachiosaurus symbol. Hit 5 of these and you will win 5000X your bet! To play Jurassic Slots, select your coin value located at the right above the “Spin” button. Hit “Bet One” for however many paylines you wish to play. You may also hit the numbers at the sides to set the active paylines. If you wish to play all 25 paylines, you can hit “Bet Max” and you will spin the reels automatically. Jurassic Slots’ wild symbol is the T-Rex symbol. The T-Rex will substitute for all symbols in the game except for the bonus and scatter symbols. Wild symbols received during free spins will be held for all of the remaining free spins. Jurassic Slots also has a Scattered Jungle symbol. Scatter wins are multiplied by the top bet amount. Scatter wins are paid independent of the active paylines. If three scatter symbols appear anywhere on the reels, you will win 10 free spins. Additional free spins cannot be won during the Jurassic Slots free spins feature. You can use the free spins feature on Jurassic Slots to win big at English Harbour Casino! For players who get sick of clicking “Spin” so many times, Jurassic Slots has an autoplay feature just for you. You can choose the number of spins, number of seconds between spins and the stop settings. You can stop autoplay at any time by hitting “Cancel Autoplay” in the same place as the “Autoplay” button is when it is not active. Another feature found on Jurassic Slots is the stop spin feature. If you wish to manually stop the reels during a spin, you can just hit “Stop Spin” and the slot machine will suddenly come to a halt. This is not available during the autoplay feature. Vegas Technology has outdone itself once again with Jurassic Slots. Jurassic Slots provides players with an exciting slot machine with its excellent art, sound effects, music, animations and of course gameplay. Dinosaur lovers and fans of the Jurassic Park movie will enjoy playing Jurassic Slots with the 100% up to $800 over four deposits at English Harbour Casino! Can American players play Jurassic Slots for real money? All players worldwide are welcome to play Jurassic Slots at English Harbour Casino. Doesn’t Jurassic Slots have a progressive jackpot? No, Jurassic Slots does not have a progressive jackpot. You may be thinking of Jurassic Jackpot which you can play at Jackpot City Casino. You can also find a dinosaur-themed progressive jackpot slot called One Million Reels BC at Rockbet Casino. Where can I play another T-Rex slot game? For another video slot featuring the King of the Dinosaurs, please read our T-Rex Video Slot Review or play it at the USA-friendly Club USA Casino! Where can I play the Jurassic Park Casino game? What online casinos offer the Jurassic Park Slot Machine?